Have reached Kulgera and on schedule to be at Mt Dare Saturday night for the Off Centre Rally. No Telstra where we are and none at Mt Dare. 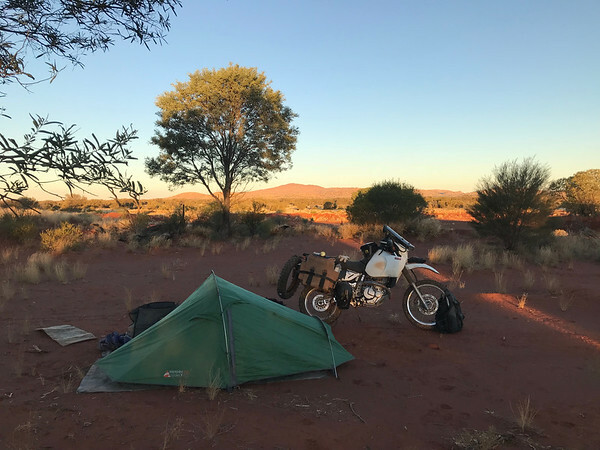 Next time you hear from me could be (should be) at Birdsville after crossing the Simpson Desert. 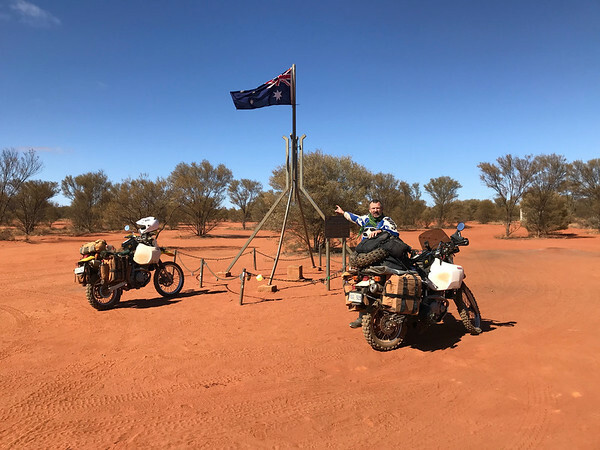 Should be at Birdsville by Thursday at the latest. Will be off the grid till then. Monitor SPOT Tracker if you are curious or concerned. Have Satelite phone in case of emergency. Raider has had a horrible 24-36 hours since leaving us earlier in the journey but I’ll let him tell the story. Nice work Anth See you've got the photos under control! 5 starters left York on Tuesday morning. We knew from the start that we would not stay together. We just didn’t quite figure on what lay ahead later that day or later that week. 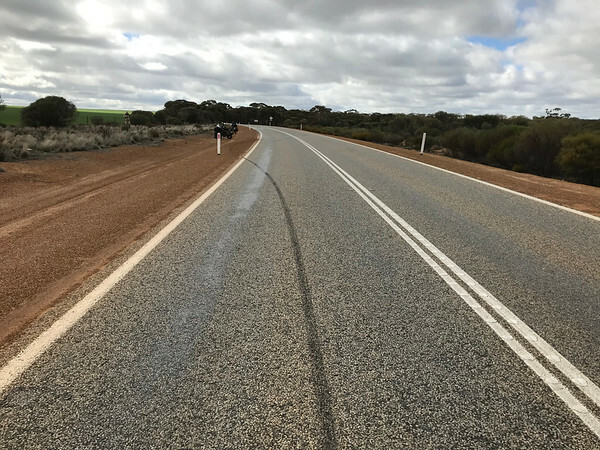 Boomer61 had a rear shocky failure around 300 km east of Perth at 100kph. The result was a rear wheel lock up and 90 metre skid. He did well to keep it upright. Big mob of camels on the Warburton-Blackstone Road. There was a similar sized mob on the other side of the road. Biggest mobs I’ve seen Outback. Late afternoon bush camp just west of Surveyor Generals Corner. The tablet has been replaced which was stolen years ago which marks the border(s). 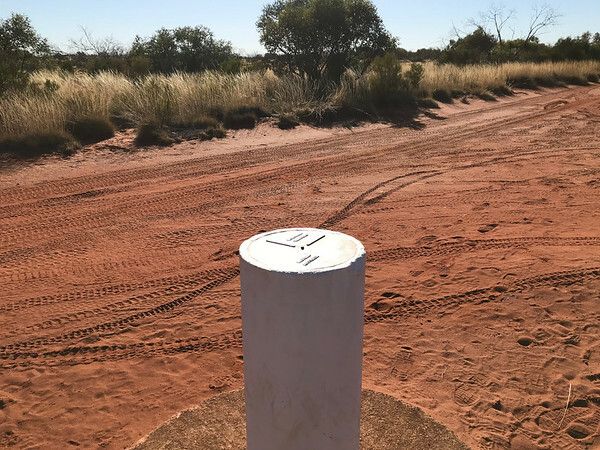 There are two plinths within 100 metres of each other marking the boundaries. 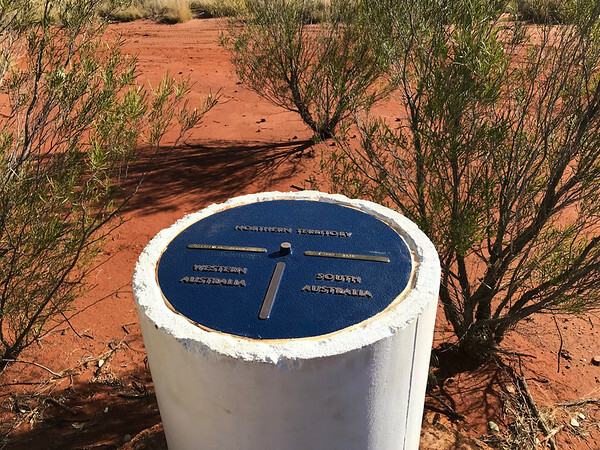 The WA Border is not a straight continuous line north south. Something to do with the earth being round (apparently). I thought it was a surveyor error (like a lot of people) but not so. 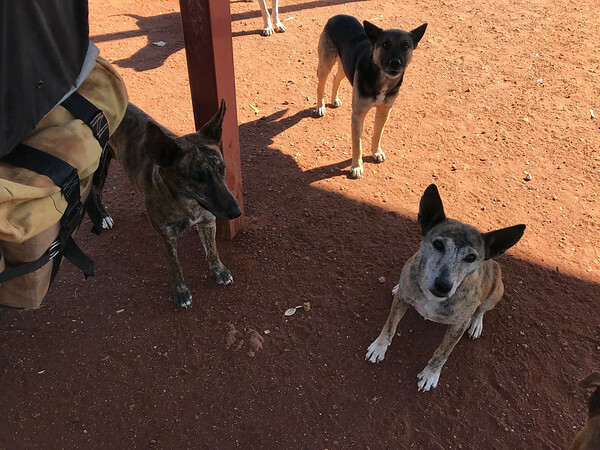 Topped up with fuel at Wingelina...local dogs salivating while I chow down on a butter chicken pie (at least that’s what they told me it was). Camped at the Kulgera Pub and linked up with Raider who had taken a different route. 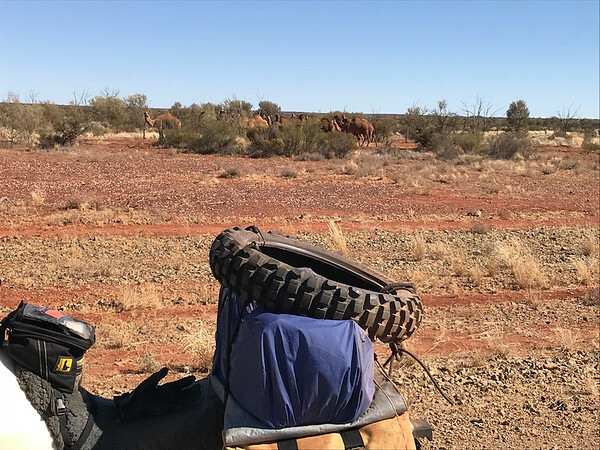 He experience Tyre/tube problems along the way which slowed his journey. 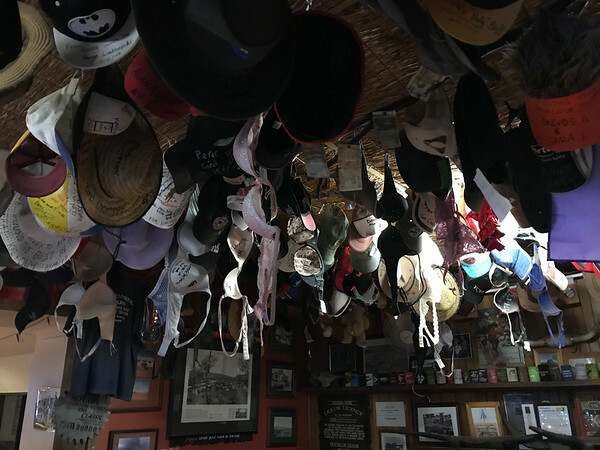 The theme at the pub must be for the ladies to get a skin full and pin their bras to the ceiling. 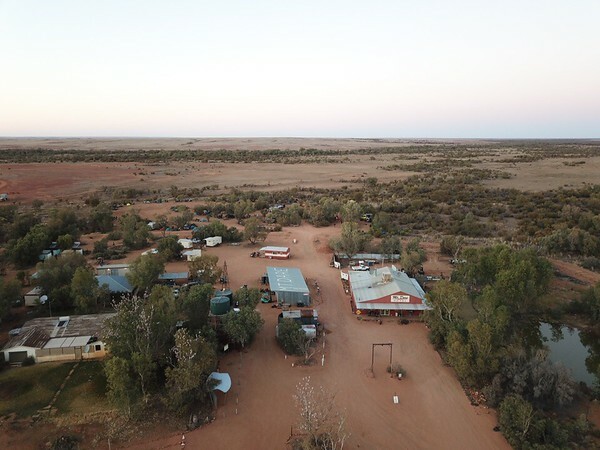 The road leading to Finke passes the turnoff to the geographical centre of Australia. Myself and HR Griceness went in to take a look. The flag staff is a miniature replica of the one above new Parliament House in Canberra. It was a bit tricky getting in and getting out...some deep sand which took a toll on both of us. Got to Mt Dare for the Off Centre Rally (OCR) for 2018. 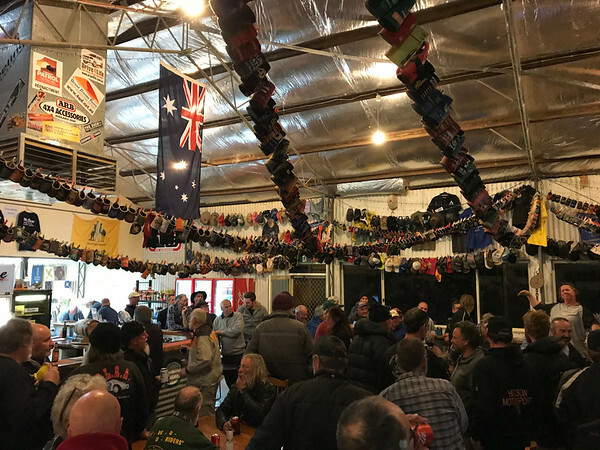 I reckon probably 200 riders attended. 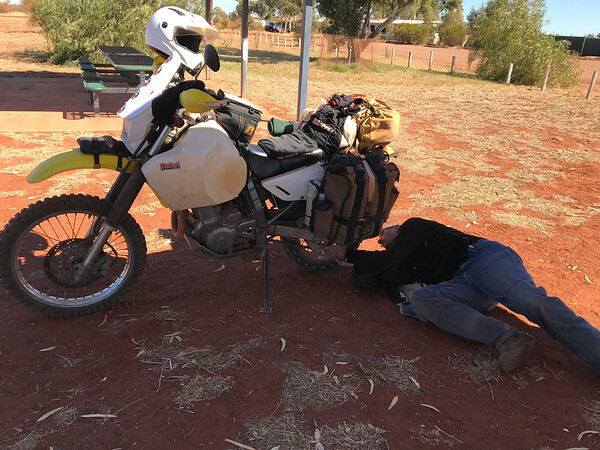 The road from Finke to Mt Dare took its toll on some riders. Not everybody rode out the following day. Part of the riders at Mt Dare. Mt Dare Hotel...last stop for fuel before heading east across the Simpson. 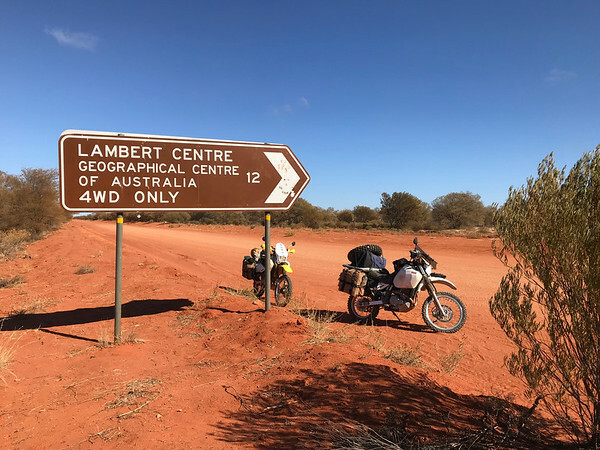 Whilst at Mt Dare HRG noticed some premature wear on his front sprocket...we had intended to cross the Simpson Desert from here. 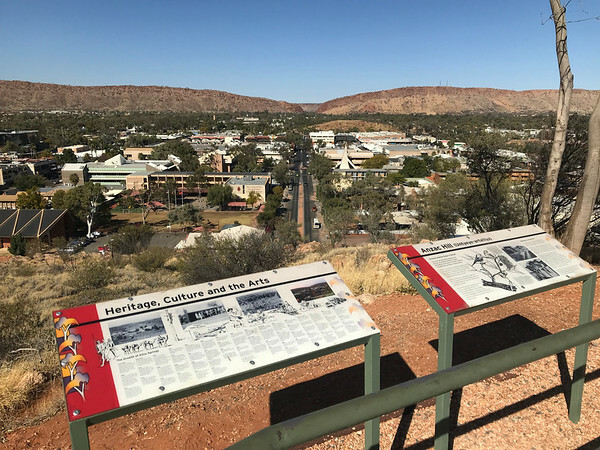 It was decided that it was too risky so we headed for Alice along the Ghan Heritage Trail. The Heritage Trail was a horrible road...heavily corrugated and some tricky sand sections for the first 100 km. We stopped for a break and I smelt fuel. Fuel tank had split. We decanted some fuel into a bladder to prevent too much loss. 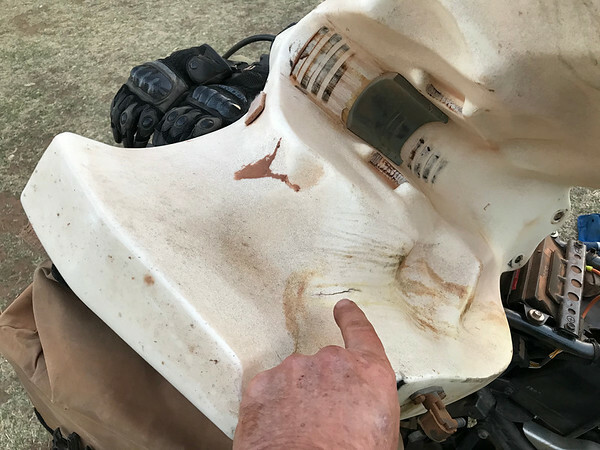 The fuel was leaking straight onto the hot exhaust. I thought we might get stuck out there or at worst case have a fire. 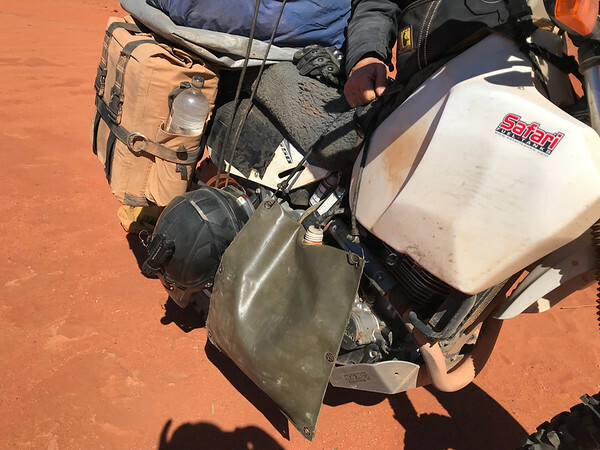 Made it to Alice ok and removed the tank...split underneath. Rang Safari Tanks this morning (Monday) to organise a replacement to be shipped in. It should arrive Thursday at the latest. Safari Tanks acknowledge that no tank should crack where it did...they are supplying the new tank free of charge. Thank you Safari Tanks!!!! 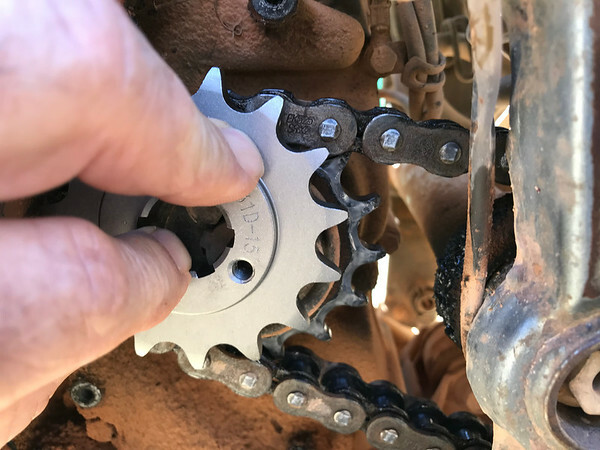 HRG has ordered a new sprocket...should be here Wednesday. 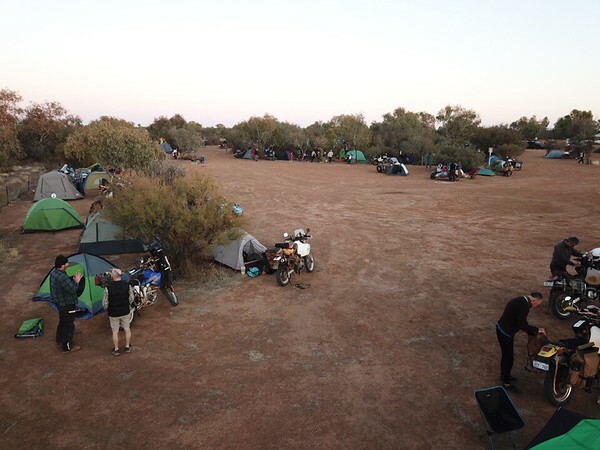 From here we go our seperate ways...I need to be in Port Augusta for the 19th to commence a supported group ride. 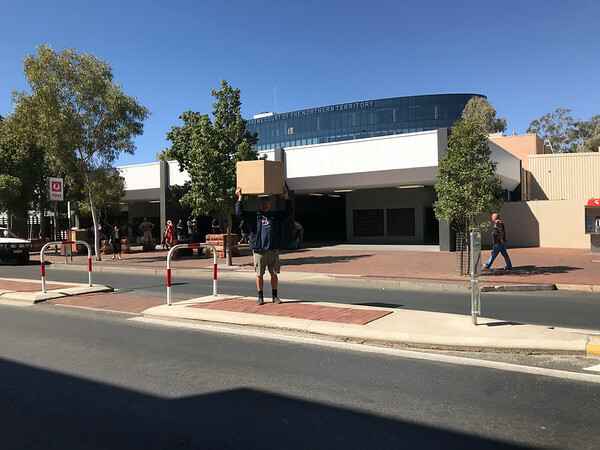 HRG is heading for Qld. Raider is heading back to WA via Great Central Road. Where was I...oh yeah, broken down in Alice Springs. Spent the following day doing some local exploring. 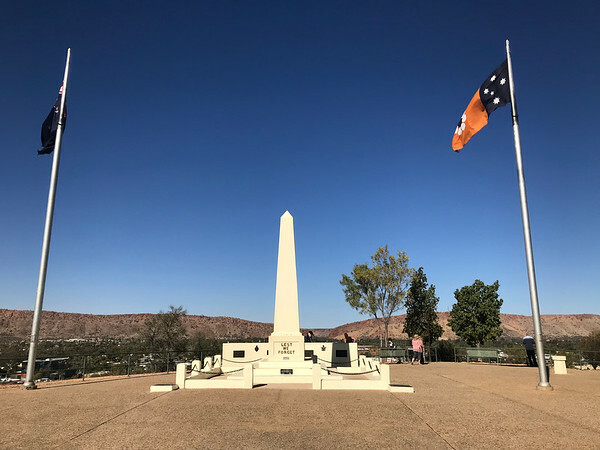 Visited ANZAC Hill which is just north of the town. The view from the Hill gives a good perspective of the town and its environs. Here you are looking south down Todd Street toward ‘The Gap’ in the distant background. Chris’ sprocket arrived a few days later but he decided to stay another day. He will keep the new one as a spare and swap it out kerbside when the other one is passed it’s use by date. Alice has matured over the years and is now like any other major regional city. It is big enough to support a Harvey Norman, K Mart, Super Cheap and many other major retail outlets. Additionally, this weekend is the Henley on Todd River Festival, a major event for the Town. Time to get out of here. 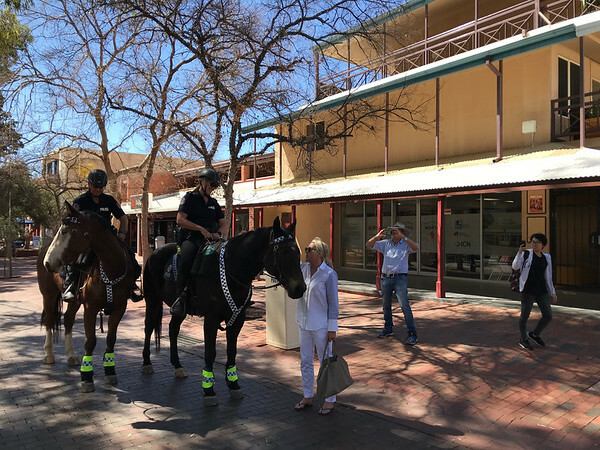 Coppers on horseback patrol the streets to make their presence felt before the Festival. 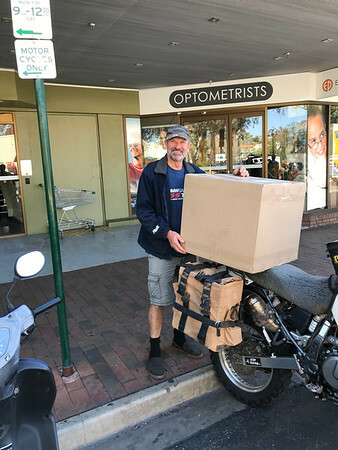 The order for the new tank was placed on Monday afternoon from regional Victoria...it arrived Thursday afternoon in Alice. Good onya Australia Post. Winner, Winner, Chicken Dinner. One happy camper...now time to race back to the caravan park and fit it. 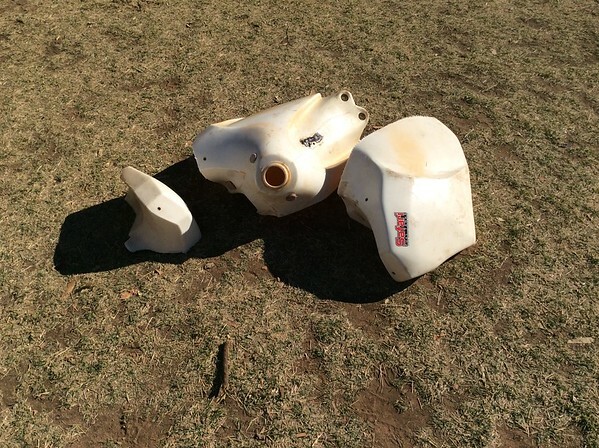 Safari Tanks requested complete destruction of the tank cause it was a warranty job. Good luck tryin’ to plastic weld that one back together. 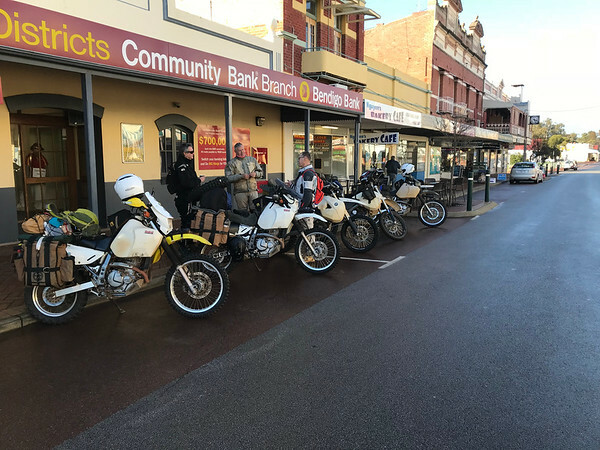 From here Chris will head to Brisbane via Donahue and Penty Highways...I will head south to Port Augusta to commence the supported group ride with Mototrekkin’. Digger wrote: Safari Tanks requested complete destruction of the tank cause it was a warranty job. Good luck tryin’ to plastic weld that one back together. Here's hoping you opened the box and fitted and tested the tank before you went to work with the saw! Some people are like Slinkys, you can't help smiling when you push them downstairs. 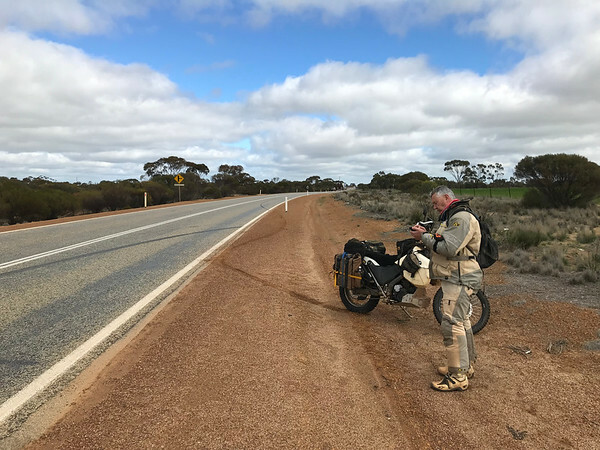 Sitting on the couch when I should be heading north to the wildflowers, I can remember a time when even that tank could be fixed with cable ties and a hot tent peg. As Plastic Bertrand "another king of the Divan" says that cutting up the old tank before checking the new would be like "Mettre le pied dans le plat". Hoping it all is "ca plane pour digger et roi griceness". Bozo wrote: I can remember a time when even that tank could be fixed with cable ties and a hot tent peg. For the record, I have some plastic welding rods with me and if it was life and death I would’ve heated up my tyre iron and gone to work on the tank. It may not have been pretty (bit like my screen) but I’m sure it would’ve got me out of trouble. P.s. Wildflowers not abundant yet.